Review | Writing a test report on a Volvo used to be a hard job. All Volvo's drove like vaults, where the only difference was that the one model was a bit more spacious or a little more luxurious than the other. This has changed over the last few years. The new Volvo's perform more dynamically and have a more outspoken design, particularly the V50. Even before turning the ignition a lot can be said about the V50. For starters its name. From now on Volvo uses odd numbers for estate cars and even numbers for sedans. The new sedan, like its predecessor, is therefore called S40. 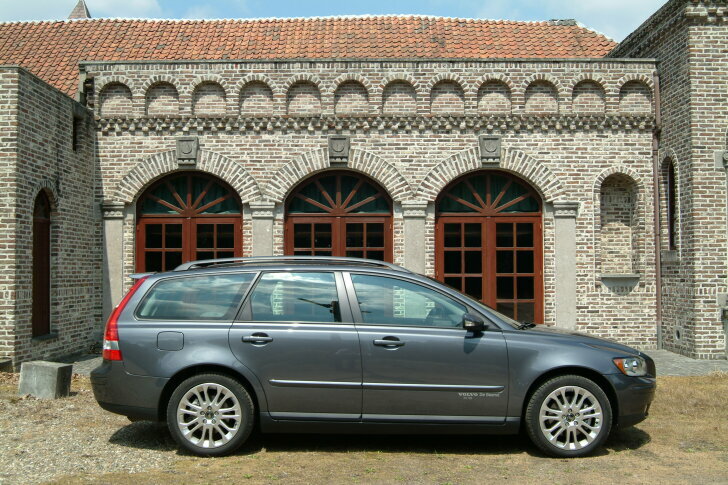 The successor of the V40 however has been named V50. The looks of this successor have to be mentioned too, as the car is smaller than its predecessor. At the same time Volvo claims to have created more inside space out of the more modest outside measurements. Still it does not feel like Volvo has gone to extremes. In many ways the V50, for a car that has only just come out, is not one of the most progressive cars. Folding the back seat for instance is a relatively cumbersome procedure. First the seat is lifted up, then the headrests need to be unclipped and finally the backrests are folded down (in two uneven parts). What is clever is that the back seat has convenient holds for the headrests. In cars from the competition the headrests are frequently all over the place. What is left in the end is a level floor, where Volvo provides hooks, eyes and other accessories. The boot is considerable (1,307 litres) and easily accessible thanks to the wide rear door. Still, the measurements of the boot as well as the space on the back seat are relatively less than average in this range. It is a shame that the rear door opens as one piece whereas it has become increasingly common for the last generation estate car to have a rear door in two pieces. Very practical however is the "umbrella stand" which is incorporated in the roll-out cover which prevents the contents of the boot from being seen by prying eyes. Cars like the V50 are often bought for their looks and not necessarily for their space. Especially here is where the V50 scores highly for this newcomer has the ability to charm from the start. The interior is smooth and modern, although not sterile and without imagination. The modern appearance doesn't restrict itself to design, but also comes back in choice of materials and for instance the graphics of the on-board computer. The seats are just as pretty and are truly phenomenally comfortable, particularly important for those who buy this car as a mile-eater. These seats do not only score on comfort, but also on that which Volvo is famous for, safety. The central console is a world apart. It does not make the usual extension of the dashboard to the tunnel. Instead Volvo chooses a slim waving sheet that comes away from the dashboard. In other words: behind the central console more storage space is created. The chosen material also makes this work of art difficult to escape ones attention. The design has the appearance of a remote control of an exclusive audio system. This comparison is not that far off, because most buttons in the central console relate to the audio systems controls. As you might expect from Volvo a lot of effort has gone into making this audio system. The sound from this standard audio system is in a word sublime. Not only for a car in this price range is the sound good, much more expensive cars do not even come anywhere near this quality. Only the audio system in Volvo's much dearer C70 Convertible is better. For buyers who find music less important, the central console offers the operation of the climate control system (left/right separately) and a phone. An interesting detail: for security reasons the phone decides for itself to bar incoming calls. If the computer registers that the driver is making a lot of steering movements, is repeatedly on the brakes or changes gears often, callers will be redirected to voice mail until circumstances on the road have improved enough to make a hands free call. To continue talking about safety: Volvo wants to point out to the buyer that the cage is constructed from extremely strong steel. Together with the backwards-placed engine the front absorbs as much impact as possible in case of an accident, whereafter the passengers are protected by the cage. Because Euro-NCAP only tests cars on a few points, Volvo continually carries out numerous tests themselves. These tests demonstrate that the V50 is currently the safest car around, according to the manufacturer's statements. When the ignition key is finally turned, a pleasant surprise awaits. This may be the safest Volvo, the V50 does not drive like the proverbial vault on wheels that is so typical of the previous models. The driver communicates well with the car and experiences less distance to the outside world than before. This is not just as a result of the handling but also due to the engine noise. The engine is so quiet, that it is hardly audible when driving calmly. Sounds from outside of the car however are emphatically present, which puts a damper on the experience of a comfortable car. Although the character differs from the S60, the V50 stands out due to lively handling and offers more driving pleasure than most Volvo's because of it. The engines help to increase driving pleasure. The V50 is available with a range of purely strong engines each with lots of power. The test vehicle equipped with a 2.4i engine has an exceptional character. As usual Volvo opts for a 5-cylinder. This construction offers more flexibility than a 4-cylinder, but isn't as thirsty as a 6-cylinder. At low revolutions the power source is good-tempered and has a character like a strong diesel engine. To indicate the power of this V50: changing gear is almost unnecessary for the car accelerates just as easily in third gear as in first only to continue on the motorway without changing gears. Only when the driver really puts his foot down, the 170 horsepower spring to life and the V50 will cause the passengers quite a stir. In day-to-day use the 2.4i is never aggressive or pushy, which doesn't make this version a party animal despite its powerful engine. The power is meant to be a good back-up, convenient to merge in with traffic smoothly and of course safely. Volvo pleasantly surprises with the V50. Comparing it to previous models the V50 is a lively car that offers lots of driving pleasure. Moreover the newcomer charms with a successful design and very original details. As an estate car this Volvo is spacious, although not meant to be a carthorse. The silent engine, magnificent seats and obviously Volvo's high safety standard make the V50 out to be a carefree mile-eater with charm.